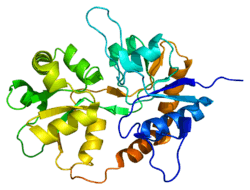 Glutamate receptor, ionotropic kainate 2 is a protein that in humans is encoded by the GRIK2 gene. This gene encodes a subunit of a kainate glutamate receptor. Glutamate receptors mediate the majority of excitatory neurotransmission in the brain. This receptor may have a role in synaptic plasticity and may be important for learning and memory. It also may be involved in the transmission of light information from the retina to the hypothalamus. The structure and function of the encoded protein is changed by RNA editing. Alternatively spliced transcript variants encoding distinct isoforms have been described for this gene. Homozygosity for a GRIK2 deletion-inversion mutation is associated with nonsyndromic autosomal recessive mental retardation. Several ion channels and neurotransmitters receptors pre-mRNA as substrates for ADARs. This includes 5 subunits of the glutamate receptor ionotropic AMPA glutamate receptor subunits (Glur2, Glur3, Glur4) and kainate receptor subunits (Glur5, Glur6). Glutamate gated ion channels are made up of four subunits per channel with each subunit contributing to the pore loop structure. The pore loop structure is related to that found in K+ channels (e.g. human Kv1.1 channel). The human Kv1.1 channel pre mRNA is also subject to A to I RNA editing. The function of the glutamate receptors is in the mediation of fast neurotransmission to the brain. The diversity of the subunits is determined, as well as RNA splicing by RNA editing events of the individual subunits. This give rise to the necessarily high diversity of these receptors. Glur2 is a gene product of the pre- mRNA of the GRIK2 gene is subject to RNA editing. ADARs bind interact directly with the dsRNA substrate via their double-stranded RNA binding domains. If an editing site occurs within a coding sequence, the result could be a codon change. This can lead to translation of a protein isoform due to a change in its primary protein structure. Therefore, editing can also alter protein function. A to I editing occurs in a noncoding RNA sequences such as introns, untranslated regions (UTRs), LINEs, SINEs( especially Alu repeats) The function of A to I editing in these regions is thought to involve creation of splice sites and retention of RNAs in the nucleus amongst others. The pre-mRNA of GLUR-6 is edited at three positions at amino acid positions 567, 571, and 621. The Q/R position is so called as editing results in an codon change from a glutamine (Q) codon (CAG ) to an arginine (R) codon (CGG). This editing site is located in the " pore loop" of the second membrane domain (M2). Q/R editing site is also observed in glutamte receptor GluR-2 and GluR-5. The Q/R site of GluR-6 pre mRNA occurs in an asymmetrical loop of 3 exonic and four intronic nucleotides. The Q/R site is located in a homologous position in GluR-2 and in GluR-6. GluR-6 is also edited at I/V and Y/C sites, which are found in the first membrane domain (M1). At the I/V site editing results in a codon change from (ATT) isoleucine (I) to (GTT)valine (V), while at the Y/C site the codon change is from (TAC) tyrosine(Y) to (TGC) cysteine (C). The RNA fold programme characterised a putative double-stranded RNA(dsRNA) conformation around the Q/R site of the GluR-6 pre-mRNA. This sequence is necessary for editing at the site to occur. The possible editing complementary sequence was observed from transcript analysis to be 1.9 kb downstream from the editing site within intron 12. The ECS for the editing sites in M1 has yet to be identified but it is likely to occur at a considerable distance from the editing sites. Editing of the Q/R site in GluR-6 pre-mRNA has been demonstrated to be developmentally regulated in rats ranging from 0% in rat embryo to 80% at birth. This is different from AMPA receptor subunit GluR-B, which is edited nearly 100% and is not developmentally regulated. Significant amounts of both edited and nonedited forms of GluR-6 transcripts are found in adult brain. The receptor is 90% edited in all grey matter structures. In white matter of the brain the receptor is in edited form in just 10% of cases. Frequency increases from 0% in rat embryo to 85% in adult rat. Editing plays a role in the electrophysiology of the channel. Editing at the Q/R site has been deemed to be nonessential in GluR-6. It has been reported that unedited version of Glu-R6 functions in the regulation of synaptic plasticity. The edited version is thought to inhibit synaptic plasticity and reduce seizure susceptibility. Mice lacking the Q/R site are capable of long term potentiation and are more susceptible to kainate induced seizures. The number of seizures inversely correlates with the amount of rna editing. This correlates to the increase in human GluR-6 pre-mRNA editing during seizures. It is thought that editing maybe an adaptive mechanism. Up to 8 different protein isoforms can occur as a result of different combinations of editing at the three sites. Editing at the Q/R site affects the calcium permeability of the receptor. The two other editing sites are less well defined (I/V,Y/C) but are also thought to be involved in regulation of calcium permeability. (59) Evidence suggests that if editing does not occur at I/V and Y/C sites then both edited and nonedited versions of the receptor demonstrate high calcium permeability. When both editing sites in TM1 are edited then the Q/R site edited version of the receptor is more permeable to calcium than the nonedited version at the Q/R site. The co assembly of these two isoforms generate receptor with reduced calcium permeability. Rna editing of the Q/R site can effect inhibition of the channel by membrane fatty acids such as arachidonic acid and docosahexaenoic acid For Kainate receptors with only edited isforms, these are strongly inhibited by these fatty acids.However inclusion of just one nonedited subunit is enough to stop this inhibition. Kainate induced seizures in mice are used as a model of temporal lobe epilepsy in humans. Despite deficiency in editing at the Q/R site of GluR-6 in mice increasing seizure vulnerability, tissue analysis of human patients did not show reduced editing at this site. ↑ Paschen W, Blackstone CD, Huganir RL, Ross CA (Aug 1994). "Human GluR6 kainate receptor (GRIK2): molecular cloning, expression, polymorphism, and chromosomal assignment". Genomics. 20 (3): 435–40. doi:10.1006/geno.1994.1198. PMID 8034316. 1 2 "Entrez Gene: GRIK2 glutamate receptor, ionotropic, kainate 2". ↑ Motazacker MM, Rost BR, Hucho T, Garshasbi M, Kahrizi K, Ullmann R, Abedini SS, Nieh SE, Amini SH, Goswami C, Tzschach A, Jensen LR, Schmitz D, Ropers HH, Najmabadi H, Kuss AW (October 2007). "A defect in the ionotropic glutamate receptor 6 gene (GRIK2) is associated with autosomal recessive mental retardation". Am. J. Hum. Genet. 81 (4): 792–8. doi:10.1086/521275. PMC 2227928 . PMID 17847003. 1 2 Mehta S, Wu H, Garner CC, Marshall J (May 2001). "Molecular mechanisms regulating the differential association of kainate receptor subunits with SAP90/PSD-95 and SAP97". J. Biol. Chem. 276 (19): 16092–9. doi:10.1074/jbc.M100643200. PMID 11279111. 1 2 Garcia EP, Mehta S, Blair LA, Wells DG, Shang J, Fukushima T, Fallon JR, Garner CC, Marshall J (Oct 1998). "SAP90 binds and clusters kainate receptors causing incomplete desensitization". Neuron. 21 (4): 727–39. doi:10.1016/s0896-6273(00)80590-5. PMID 9808460. 1 2 3 4 Hirbec H, Francis JC, Lauri SE, Braithwaite SP, Coussen F, Mulle C, Dev KK, Coutinho V, Meyer G, Isaac JT, Collingridge GL, Henley JM, Couthino V (Feb 2003). "Rapid and differential regulation of AMPA and kainate receptors at hippocampal mossy fibre synapses by PICK1 and GRIP". Neuron. 37 (4): 625–38. doi:10.1016/s0896-6273(02)01191-1. PMC 3314502 . PMID 12597860. ↑ Kohda K, Kamiya Y, Matsuda S, Kato K, Umemori H, Yuzaki M (Jan 2003). "Heteromer formation of delta2 glutamate receptors with AMPA or kainate receptors". Brain Res. Mol. Brain Res. 110 (1): 27–37. doi:10.1016/s0169-328x(02)00561-2. PMID 12573530. ↑ Wenthold RJ, Trumpy VA, Zhu WS, Petralia RS (Jan 1994). "Biochemical and assembly properties of GluR6 and KA2, two members of the kainate receptor family, determined with subunit-specific antibodies". J. Biol. Chem. 269 (2): 1332–9. PMID 8288598. ↑ Ripellino JA, Neve RL, Howe JR (Jan 1998). "Expression and heteromeric interactions of non-N-methyl-D-aspartate glutamate receptor subunits in the developing and adult cerebellum". Neuroscience. 82 (2): 485–97. doi:10.1016/s0306-4522(97)00296-0. PMID 9466455. 1 2 Hirbec H, Perestenko O, Nishimune A, Meyer G, Nakanishi S, Henley JM, Dev KK (May 2002). "The PDZ proteins PICK1, GRIP, and syntenin bind multiple glutamate receptor subtypes. Analysis of PDZ binding motifs". J. Biol. Chem. 277 (18): 15221–4. doi:10.1074/jbc.C200112200. PMID 11891216. ↑ Seeburg PH, Single F, Kuner T, Higuchi M, Sprengel R (July 2001). "Genetic manipulation of key determinants of ion flow in glutamate receptor channels in the mouse". Brain Res. 907 (1-2): 233–43. doi:10.1016/S0006-8993(01)02445-3. PMID 11430906. ↑ Bhalla T, Rosenthal JJ, Holmgren M, Reenan R (October 2004). "Control of human potassium channel inactivation by editing of a small mRNA hairpin". Nat. Struct. Mol. Biol. 11 (10): 950–6. doi:10.1038/nsmb825. PMID 15361858. ↑ 52. Seeburg PH, Higuchi M, Sprengel R. Brain Res Brain Res Rev. 1998;26:217–29. 1 2 Sommer B, Köhler M, Sprengel R, Seeburg PH (October 1991). "RNA editing in brain controls a determinant of ion flow in glutamate-gated channels". Cell. 67 (1): 11–9. doi:10.1016/0092-8674(91)90568-J. PMID 1717158. 1 2 Bernard A, Khrestchatisky M (May 1994). "Assessing the extent of RNA editing in the TMII regions of GluR5 and GluR6 kainate receptors during rat brain development". J. Neurochem. 62 (5): 2057–60. doi:10.1046/j.1471-4159.1994.62052057.x. PMID 7512622. ↑ Niswender CM (September 1998). "Recent advances in mammalian RNA editing". Cell. Mol. Life Sci. 54 (9): 946–64. doi:10.1007/s000180050225. PMID 9791538. 1 2 3 Köhler M, Burnashev N, Sakmann B, Seeburg PH (March 1993). "Determinants of Ca2+ permeability in both TM1 and TM2 of high affinity kainate receptor channels: diversity by RNA editing". Neuron. 10 (3): 491–500. doi:10.1016/0896-6273(93)90336-P. PMID 7681676. 1 2 Vissel B, Royle GA, Christie BR, Schiffer HH, Ghetti A, Tritto T, Perez-Otano I, Radcliffe RA, Seamans J, Sejnowski T, Wehner JM, Collins AC, O'Gorman S, Heinemann SF (January 2001). "The role of RNA editing of kainate receptors in synaptic plasticity and seizures". Neuron. 29 (1): 217–27. doi:10.1016/S0896-6273(01)00192-1. PMID 11182093. ↑ Bernard A, Ferhat L, Dessi F, Charton G, Represa A, Ben-Ari Y, Khrestchatisky M (February 1999). "Q/R editing of the rat GluR5 and GluR6 kainate receptors in vivo and in vitro: evidence for independent developmental, pathological and cellular regulation". Eur. J. Neurosci. 11 (2): 604–16. doi:10.1046/j.1460-9568.1999.00479.x. PMID 10051761. ↑ Grigorenko EV, Bell WL, Glazier S, Pons T, Deadwyler S (July 1998). "Editing status at the Q/R site of the GluR2 and GluR6 glutamate receptor subunits in the surgically excised hippocampus of patients with refractory epilepsy". Neuroreport. 9 (10): 2219–24. doi:10.1097/00001756-199807130-00013. PMID 9694203. ↑ Nadler JV (November 1981). "Minireview. Kainic acid as a tool for the study of temporal lobe epilepsy". Life Sci. 29 (20): 2031–42. doi:10.1016/0024-3205(81)90659-7. PMID 7031398. ↑ Ben-Ari Y (February 1985). "Limbic seizure and brain damage produced by kainic acid: mechanisms and relevance to human temporal lobe epilepsy". Neuroscience. 14 (2): 375–403. doi:10.1016/0306-4522(85)90299-4. PMID 2859548. ↑ Kortenbruck G, Berger E, Speckmann EJ, Musshoff U (June 2001). "RNA editing at the Q/R site for the glutamate receptor subunits GLUR2, GLUR5, and GLUR6 in hippocampus and temporal cortex from epileptic patients". Neurobiol. Dis. 8 (3): 459–68. doi:10.1006/nbdi.2001.0394. PMID 11442354. Seeburg PH, Higuchi M, Sprengel R (1998). "RNA editing of brain glutamate receptor channels: mechanism and physiology.". Brain Res. Brain Res. Rev. 26 (2-3): 217–29. doi:10.1016/S0165-0173(97)00062-3. PMID 9651532. Paschen W, Hedreen JC, Ross CA (1994). "RNA editing of the glutamate receptor subunits GluR2 and GluR6 in human brain tissue.". J. Neurochem. 63 (5): 1596–602. doi:10.1046/j.1471-4159.1994.63051596.x. PMID 7523595. Hoo KH, Nutt SL, Fletcher EJ, Elliott CE, Korczak B, Deverill RM, Rampersad V, Fantaske RP, Kamboj RK (1995). "Functional expression and pharmacological characterization of the human EAA4 (GluR6) glutamate receptor: a kainate selective channel subunit.". Recept. Channels. 2 (4): 327–37. PMID 7536611. Sander T, Janz D, Ramel C, Ross CA, Paschen W, Hildmann T, Wienker TF, Bianchi A, Bauer G, Sailer U (1995). "Refinement of map position of the human GluR6 kainate receptor gene (GRIK2) and lack of association and linkage with idiopathic generalized epilepsies.". Neurology. 45 (9): 1713–20. doi:10.1212/wnl.45.9.1713. PMID 7675232. Nutt SL, Kamboj RK (1995). "RNA editing of human kainate receptor subunits.". NeuroReport. 5 (18): 2625–9. doi:10.1097/00001756-199412000-00055. PMID 7696618. Raymond LA, Blackstone CD, Huganir RL (1993). "Phosphorylation and modulation of recombinant GluR6 glutamate receptors by cAMP-dependent protein kinase.". Nature. 361 (6413): 637–41. doi:10.1038/361637a0. PMID 8094892. Taverna FA, Wang LY, MacDonald JF, Hampson DR (1994). "A transmembrane model for an ionotropic glutamate receptor predicted on the basis of the location of asparagine-linked oligosaccharides.". J. Biol. Chem. 269 (19): 14159–64. PMID 8188697. Wenthold RJ, Trumpy VA, Zhu WS, Petralia RS (1994). "Biochemical and assembly properties of GluR6 and KA2, two members of the kainate receptor family, determined with subunit-specific antibodies.". J. Biol. Chem. 269 (2): 1332–9. PMID 8288598. Pickering DS, Taverna FA, Salter MW, Hampson DR (1996). "Palmitoylation of the GluR6 kainate receptor.". Proc. Natl. Acad. Sci. U.S.A. 92 (26): 12090–4. doi:10.1073/pnas.92.26.12090. PMC 40302 . PMID 8618850. Porter RH, Eastwood SL, Harrison PJ (1997). "Distribution of kainate receptor subunit mRNAs in human hippocampus, neocortex and cerebellum, and bilateral reduction of hippocampal GluR6 and KA2 transcripts in schizophrenia.". Brain Res. 751 (2): 217–31. doi:10.1016/S0006-8993(96)01404-7. PMID 9099808. Rubinsztein DC, Leggo J, Chiano M, Dodge A, Norbury G, Rosser E, Craufurd D (1997). "Genotypes at the GluR6 kainate receptor locus are associated with variation in the age of onset of Huntington disease.". Proc. Natl. Acad. Sci. U.S.A. 94 (8): 3872–6. doi:10.1073/pnas.94.8.3872. PMC 20534 . PMID 9108071. Garcia EP, Mehta S, Blair LA, Wells DG, Shang J, Fukushima T, Fallon JR, Garner CC, Marshall J (1998). "SAP90 binds and clusters kainate receptors causing incomplete desensitization.". Neuron. 21 (4): 727–39. doi:10.1016/S0896-6273(00)80590-5. PMID 9808460. Smith HJ (2001). "The introduction of MR in the Nordic countries with special reference to Norway: central control versus local initiatives.". Journal of magnetic resonance imaging : JMRI. 13 (4): 639–44. doi:10.1002/jmri.1090. PMID 11276111. Mehta S, Wu H, Garner CC, Marshall J (2001). "Molecular mechanisms regulating the differential association of kainate receptor subunits with SAP90/PSD-95 and SAP97.". J. Biol. Chem. 276 (19): 16092–9. doi:10.1074/jbc.M100643200. PMID 11279111.